She held up a pair of cotton gloves that were obviously way too small. I rubbed my chin. I was pretty sure in doing so I had also just wiped her snot on my lips. It’s not what kept me going. That was my stubbornness and pride. But the gloves slowly warmed my fingers, and made me slightly less than completely miserable. It helped a lot, less because of the warmth of the gloves and more because of the warmth of this small gesture of kindness. I don’t know what my finish time was, nor do I want to. I made it to the end way before the generous cut off, ate a couple pieces of what was left of the now cold pizza they had provided marathon finishers, and left with a metal. I’d hit a wall at around mile 15 and just sat by the side of the walkway behind the mile marker sign for several minutes, not another runner in sight, wondering what the rest of the race would be like if I already felt this bad. From there I felt worse and worse, and walked (with much difficulty) too much of the last 11 miles. I enjoyed the first half. My pace was half-way decent. 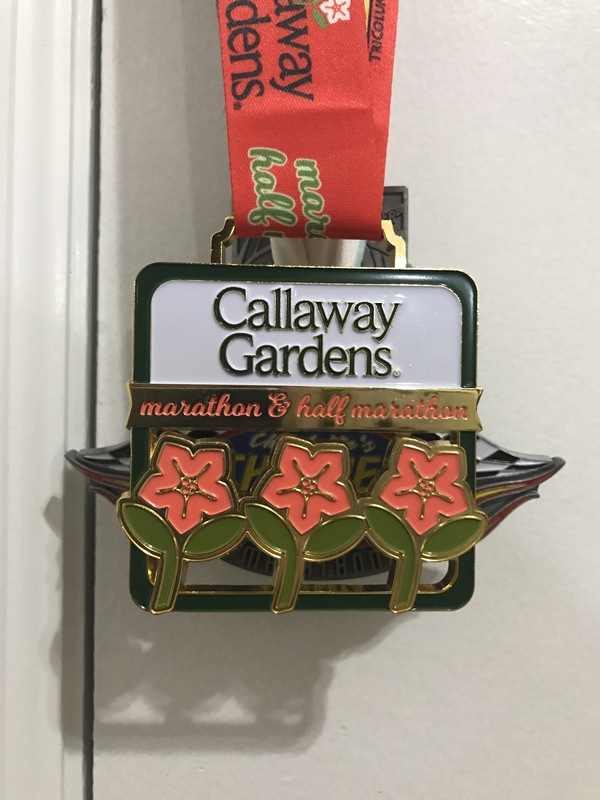 I talked briefly with a couple other runners, including a first time marathoner being supported that day by his wife and two sons, whose enthusiasm was energizing. At halfway I felt I was doing okay, but as I passed by the finish line for the second lap of the course, I began wishing it would just be over knowing how far I still had to go. Repeating what I had already run, thinking about how much better I felt the first time around. Watching all of the few racers around me turn off to the right excited to complete their half-marathon run. Dreading every difficult section before I came to it. I let it all start to sap away my motivation, and by mile 15 it was sapped. That’s NOT to suggest this was just a mental breakdown. My body was rebelling. I hadn’t run since my final training run before the Mississippi Blues Marathon (which was cancelled). That was four weeks ago. And I had been slacking in my consistency leading up to that. I had just slept in my car, not well, having signed up for this at the last minute and deciding I didn’t feel like paying for a hotel room. I didn’t eat a good meal the night before, at least not an appropriate meal for the night before a marathon, being more concerned about preventing the need for porta-potty use during the race than I was about properly supplying my body with the nutrition I needed to run a marathon. And I was cold. I should have worn an extra layer, but with the forecast being sunny with a high of around 50, I figured the at-freezing temperatures at the beginning of the race would be worth enduring to not have to carry along any more clothing than I did. I was wrong. I guess I’ll have to take these races more seriously. I feel motivated to drop a few pounds and be consistent in my training before the next race about a month from now. I am glad I went. I’m glad I finished. It can’t get any worse than that, even on an ultra-marathon, right? RIGHT? …please tell me I’m right. Obviously THAT wasn’t the best part. The best part was shortly after that mile 15.2 aid station when I passed a woman who had just completed the half and was supporting her friend that had just passed by me at the aid station. She had her SUV parked beside the road. I was slogging by feeling pretty low and probably looking as miserable as I felt. She saw me pulling my sleeves around my fingers.